These Bluetooth headphones will have DJs and audiophiles alike tapping their toes to the beat. 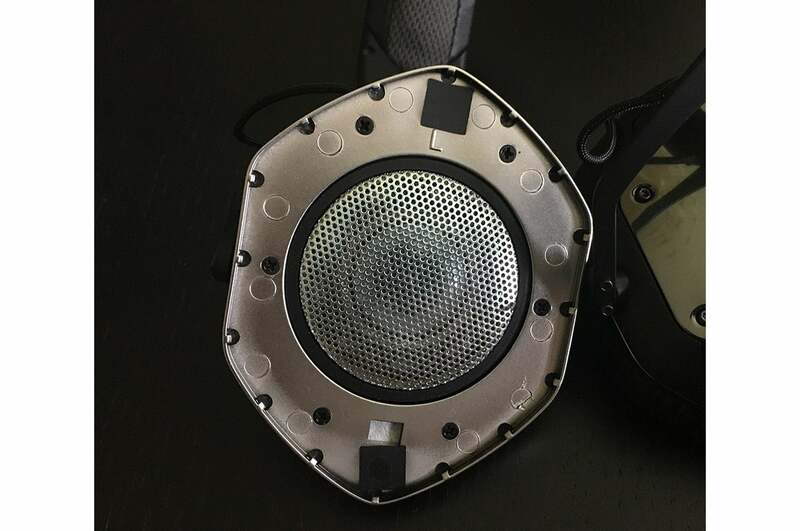 Looking for our review of V-Moda's newer Crossfade 2 Wireless? Click here. V-Moda CEO Val Kolton set out to make a splash in the headphone market by merging superb sound with impeccable style. Judging by V-Moda’s Crossfade line of headphones, he’s achieved his goal and then some. In a relatively short period, DJs have made V-Moda their headphone brand of choice and audiophiles have also embraced the brand. The 12-year-old company’s success drew the attention of the electronic musical instrument manufacturer Roland, which took a majority stake in V-Moda in August. 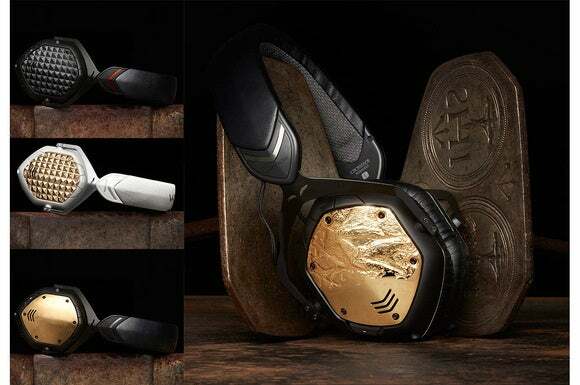 Kolton’s latest creation brings Bluetooth connectivity to the V-Moda bag of tricks, and it’s battery is rated to deliver up to 12 hours of music listening (with a 30-minute “quick charge” providing more than three hours of battery life). It can pair with two devices simultaneously, but it surprisingly doesn’t support the aptX codec. Three tactile controls—volume minus, play/pause, and volume plus—are situated on the top of the right ear cup for your index finger to easily find. The on/off/pairing switch sits perfectly where your thumb lies. The play/pause button actually wears a few hats: Pressing and holding it will activate Siri on an iOS device. Pressing it twice quickly will advance a song. Pressing it three times will go back. Each of the functions worked like a charm, but be aware that there isn’t a lot of tactile difference between the buttons. I initially found it difficult to know which button I was pressing. After a few minutes, I began using the triangular point of the middle button to orient myself and I was fine after that. But I needed that orientation frequently. I can understand why the team at V-moda designed it this way from an aesthetic point of view, but it’s not functionally intuitive. V-Moda offers a line of high-quality cables and accessories. The company sent its memory-foam ear cups, SpeakEasy inline remote cable, and BoomPro microphone. Make no mistake, Kolton doesn’t want you to think of this as simply a wireless version of the acclaimed Crossfade 100. He wants you to see this as V-Moda’s best headphone ever. The heart of the Crossfade Wireless is a 50mm dual-diaphragm driver that the company says is patented. What separates the V-Moda line from perhaps any other headphone is its customizability and its line of accessories. You can purchase your headphones in black, white/silver, or with a color trim. The decorative ear cup shields are customizable. You can chose from laser-engraved aluminum to 3D-printed shields. You can brand the shields with stock crests or upload your own design using V-Moda-provided Adobe Photoshop or Adobe Illustrator templates. 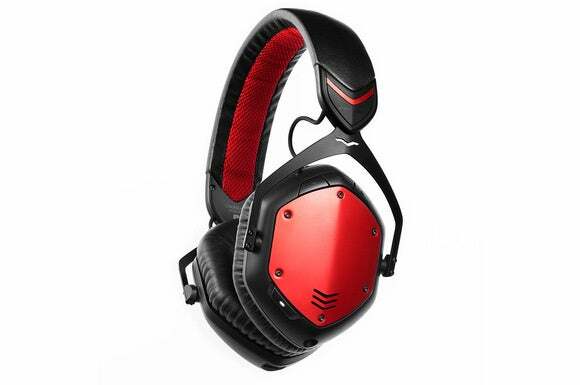 V-Moda Crossfade Wireless comes in different colors and accents and can be customized with different shields. Want real bling? Precious metals such as sterling silver, 14k Gold (in a variety of shades) all the way up to platinum are available too. 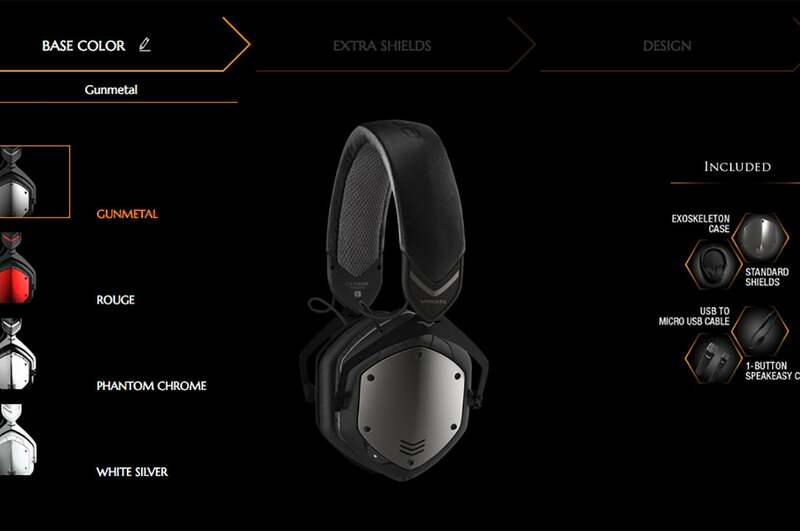 A pair of V-Moda’s with solid platinum, monogrammed shields will set you back $30,000. Accessorizing the headphones doesn’t stop there. There’s a nice assortment of extremely useful, high-quality cables, too. 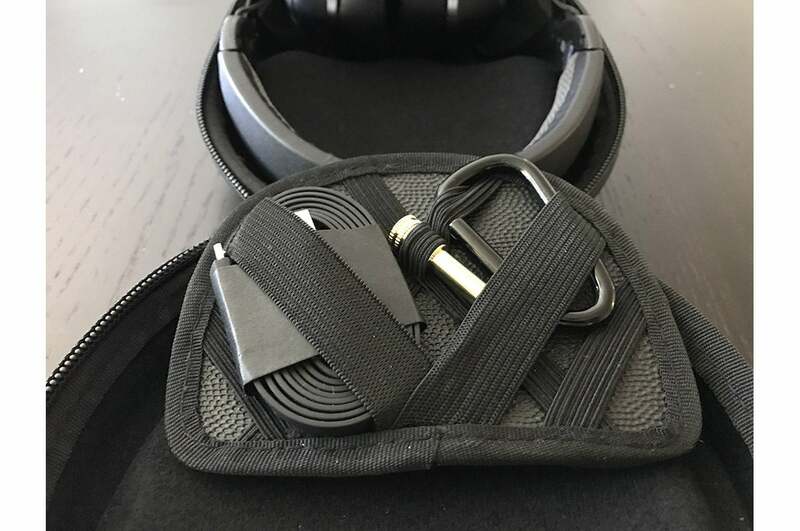 You can purchase pro-style coiled cables—one with a boom-microphone extension—or a cable that allows you to connect a second pair of headphones to the main jack for sharing a single music source. I absolutely loved using the boom-mic extension, it is among the best headphone mic accessories I’ve ever used. You can customize your headphones online with V-Moda’s step-by-step customization. Most of V-Moda’s cables come with a high-quality, no-tangle, nylon sheath. 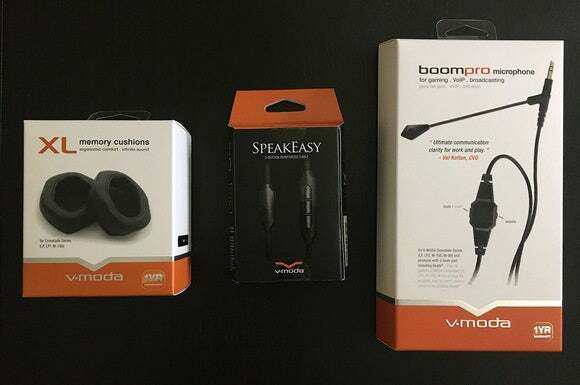 V-Moda has adapters for 1/4-inch connectors and even a unique splitter that allows you to use your V-Moda headphones with computers or VoIP systems that require dedicated microphone and headphone jacks. The ear cups are replaceable. You can also purchase extra-large versions, in case you need more space, and you can upgrade to memory-foam cushions. The the accessories are compatible regardless of which model V-Moda you have, so your investment in accessories will last. Kolton has made a staunch commitment to his loyal customers to keep accessories compatible across the product line. The V-Moda Crossfade Wireless come with an “exoskeleton” case, a USB charging cable, a wired cable, and a carabiner. 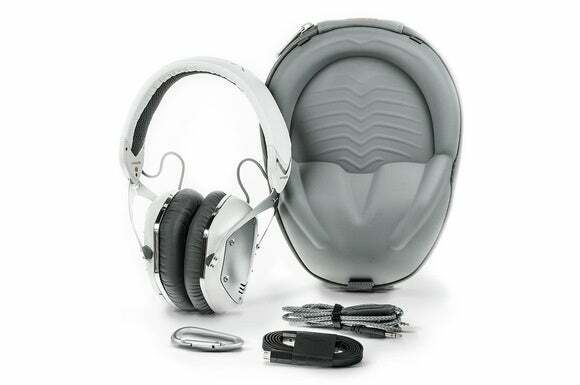 V-Moda’s Italian design sense is present every aspect of its products down to the “exoskeleton” carrying case, which is slender with a rubberized exterior resembling a breastplate. There’s a removable Velcro pad inside, with thick crisscrossing elastics to hold the included 1/4-inch adapter, USB charging cable and a whole host of small accessories. Very smart. The Crossfade Wireless feels like a studio headphone when you put it on. Its dense and substantial feels almost perfectly balanced in your hand without feeling heavy. Too many headphones press harder at the bottom of the ear cups than they do further up. The Steelflex headband—which is strong enough to withstand being flattened and then springing back—applies pressure perfectly evenly. And while the stock ear cups are comfortable, the memory-foam replacements are so much better. I wore those for almost all my listening tests. Removing those stock ear cups is simple, but it took more force than I was initially willing to exert for fear of breaking the headphones. V-Moda’s online video tutorial was helpful in this regard. Installing the new ear cups took some care, but it didn’t take long. The Crossfade Wireless’ ear pads are removable, but the process isn’t as simple as it is with headphones with magnetic ear cups. V-Moda heaphones have always offered excellent noise isolation so you can enjoy your music without distraction in exceptional comfort. You’ll quickly forget that they’re on your head. The Crossfade Wireless don’t reveal as many details or nuances in the music as the more expensive B&W P7 Wireless or Oppo PM-2 that I recently reviewed. These headphones exhibit a warm, smooth sound, but the trumpets on Aaron Copland’s “Fanfare For the Common Man” shined. But things were almost too smooth at times; I found myself craving just a bit more detail. The Crossfade Wireless sound more exciting with less sonically demanding fare. Alanis Morissette’s “Guardian,” from Havoc and Bright Lights, absolutely rocked. These aren’t laid-back headphones, they produce energetic and pronounced bass without resorting to gimmickery. This works well with some tracks. The deep synthesizer lines on Alanis Morissette’s “Woman Down” were truly club-like, and Stevie Ray Vaughan’s “Tin Pan Alley” dug deep into the blues. But that frequency emphasis ultimately comes at a cost. To my ears, the extra dose tended to extend into the midbass and lower midrange, so that on complex tracks like “Claw Trucks” or “Chapter Doof” from the Mad Max: Fury Road soundtrack, the low end deadened the bite of the midrange, smearing the presentation. The “exoskeleton” case has a removable Velcro pad that can hold several small accessories. I can back Kolton’s claim that the Crossfade Wireless’ wired and wireless modes sound very similar. But similar is not same. These headphones dug deep and roared when I played the 24-bit/192kHz FLAC version of “Imagine the Fire,” from The Dark Knight Rises soundtrack through them. They sounded great via Bluetooth streamed from both an Astell&Kern AK70 and an iPhone 6s, but not as good as they sounded with hardwired connections to those devices. Plugging in yielded a crisper top end, the midrange was a bit more transparent, and the bass was better defined. I loved the convenience of Bluetooth, but the cable delivered more refined performances. V-Moda’s case and accessories match the color of the headphones. 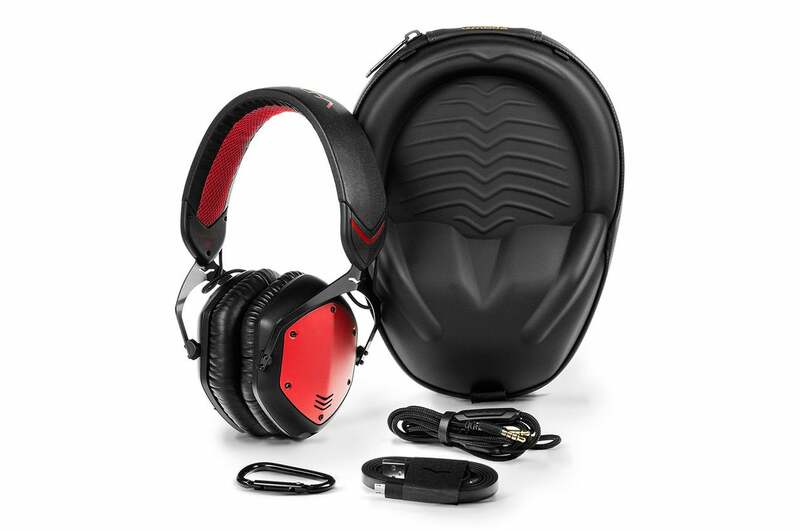 I love the V-Moda Crossfade Wireless—they rock. They’re stylish and customizable, with superb build quality from top to bottom. 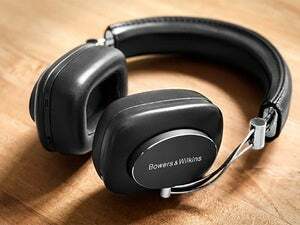 If you’re looking for great-sounding wireless headphones that will imbue your music with excitement and an extra bottom-end kick—albeit at the expense of some musical detail—these are the headphones you’ve been looking for. They're V-Moda’s best-sounding analog headphones, they just happen to be wireless. V-Moda blends rugged design, audiophile quality, and look-at-me style to produce a terrific set of wireless headphones.